Jim Bentley has challenged Jason Oswell and Mark Halstead to stake their claims for long-term starting spots with Morecambe. The duo, who both came in over the summer, have found themselves in the starting XI ahead of Vadaine Oliver and skipper Barry Roche respectively. 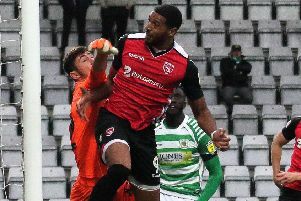 Oswell has been in and out of the side after making the move from National North club Stockport County but scored his first league goal against Port Vale last time out. Bentley told Thursday night’s fans forum: “He’s deserved his chance. “We feel Vadaine Oliver is playing well but not chipping in with goals even though he’s occupying people and letting others do their stuff. “It’s been tough for Ossie to acclimatise but he’s had some positive input at times and we took the option to start him at MK Dons. “It’s down to him to grab his chance and, if players do well, they will stay in the team. Halstead, for his part, had only played three games until being pressed into action following Roche’s thigh injury at the end of October. He’s played the last eight games and kept his starting spot despite the captain returning to fitness in that time. “Mark has done nothing wrong,” Bentley said. “He’s stepped into Baz’s boots, he was excellent against Yeovil and he’s turned in some other excellent performances. “I’ve spoken to Baz about it but I’ve got to be true to Mark; if he does well then he holds the position.